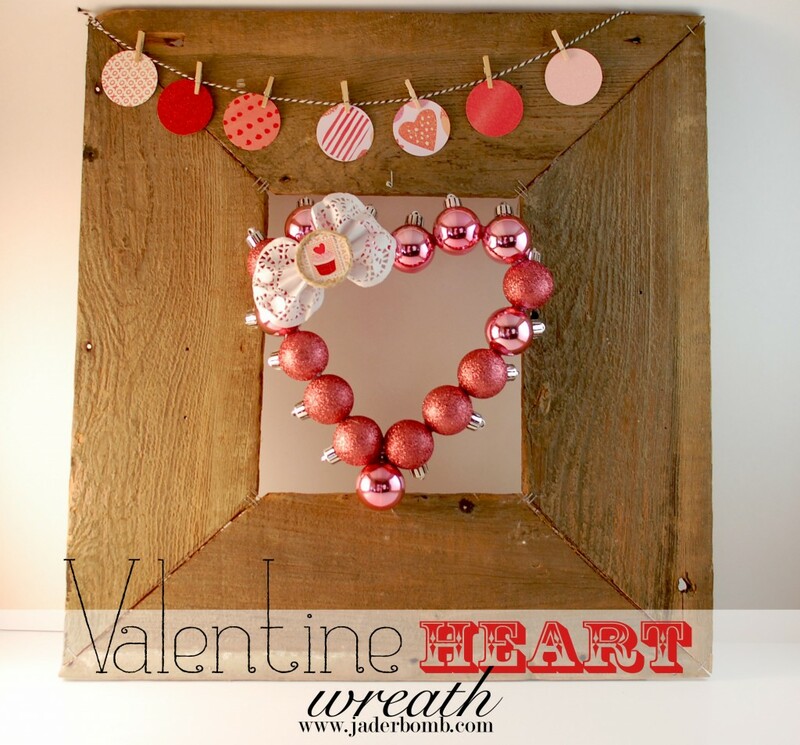 If you are looking for a easy way to decorate for Valentines day then look no further because I have an affordable tutorial for you using pink Christmas ornaments. I think it’s hard to decorate for each holiday for the simple fact that it can get pretty expensive. Remember supermarket sweep? I used to love that show. When I am in the craft store just browsing I always go strait to the sale isles. Why? Because there is no way I will spend the full price on things when I will end up change the whole appearance anyway. So back to supermarket sweep, I always pretend I am on that show and will give myself 10 minutes in those isles, NO matter how many isles there are. Being crafty sometimes means thinking on your toes and usually you think of how you can use an item within the first 5 seconds of looking at it. Trust that first thought. It’s usually the best one. I love after Christmas sales, especially when things are 80% off. I try to not go until it’s that low. I figure if something good is already gone I will never know, haha. Plus I tell myself that whatever is left it’s up to me to use it in another creative way. 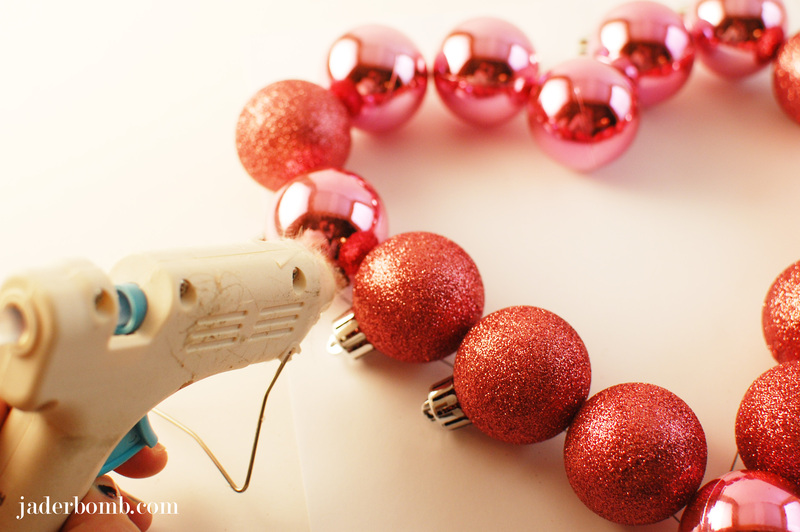 That’s exactly what I did with the ornaments in this craft. The box was originally 5.00 and I paid .50 for them. I think that is a good deal! I bought big ones and small ones. You never know when you will need extra balls. 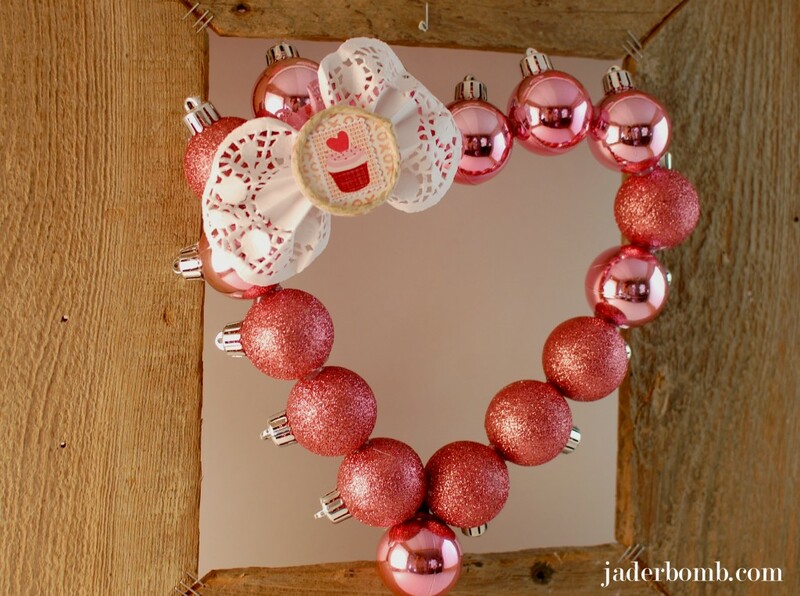 Isn’t this wreath so cute! You can order all the items above from one spot, just click on the link. Are you swooning over everything I used? I love anything glittery and pink, it always puts me in a fabu-loso mood. 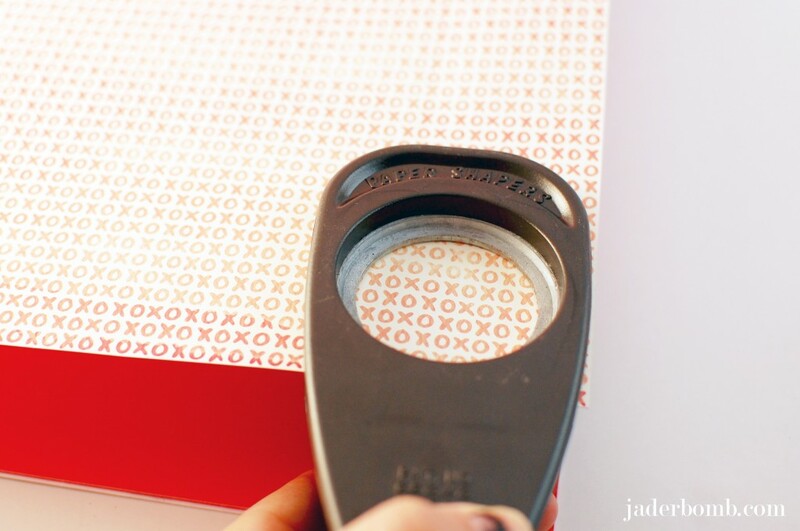 K, the first thing you will do is get a piece of paper and draw out a heart or print one. You can click HERE to download the one I used. Glue each one together. Wait till the glue is dry before you move on to the next spot. I bought these paper doilies from Freds in the birthday party isle. For a pack of 24 it was $1.00. Booyah, you know I grabbed all 45. 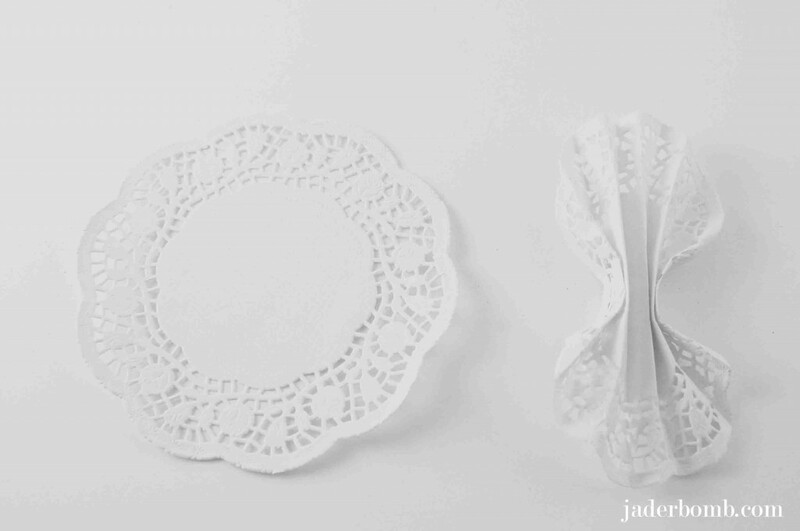 Fold a doily like an accordion then set to the side. Punch out a circle. I swear when you do one you will want to keep on, it’s addicting. 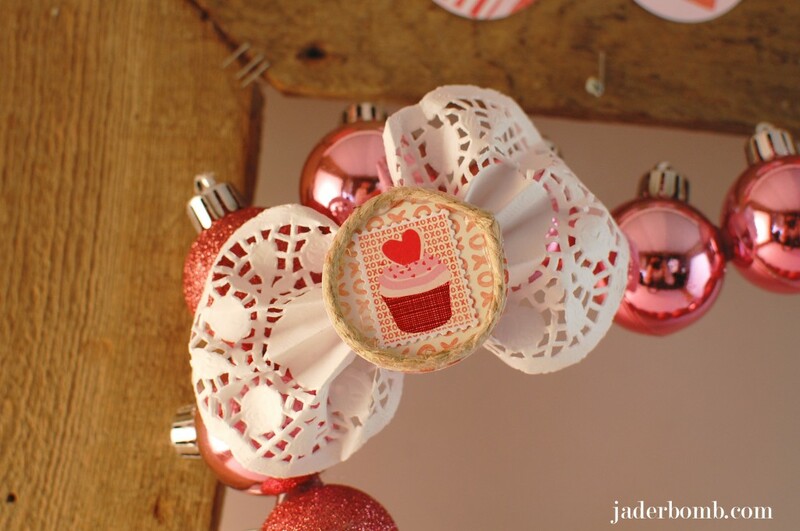 Now is the time you will glue your paper doily onto your wreath, wherever you want to put it. 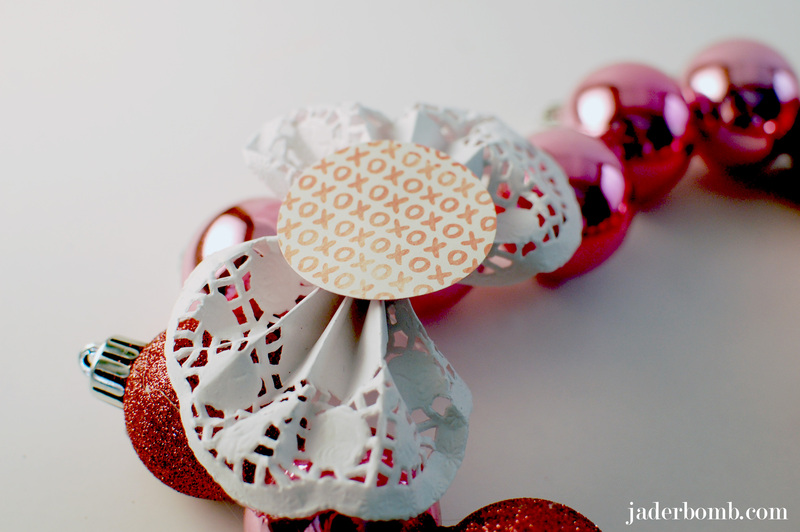 Add your punch out in the middle of doily. I wrapped a little twine around my punch out then placed a cute cupcake sticker in the middle. So it’s that simple. What I like the most about this is I can keep a fun pink heart up all year round. I hope you enjoyed learning how to make a heart wreath out of ornaments. 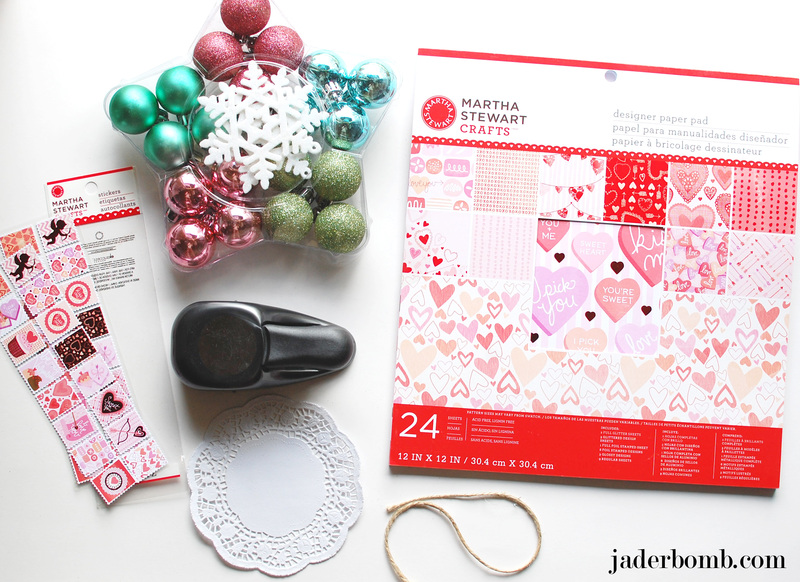 What is your favorite holiday to decorate for? I’d love to know, let me know in the comment section. Wanna check out more of my Valentines tutorials? Click HERE.